The Hyundai Genesis coupe is a powerful rear-wheel drive beast and has plenty of get-up and go (especially if you have a 3.8) – but all that acceleration does you no good if you can’t stop. The OEM brakes of the Genesis coupe can leave a bit to be desired, so our Genesis Coupe Modification Experts put together a few key upgrades to keep your GenCoupe’s brakes from fading under demanding conditions. Since your brakes are what’s keeping your front end from being inside that minivan that just pulled out in front of you, they’re pretty important. 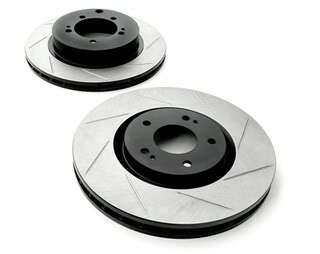 Listed below are the four pieces of the puzzle to getting the most out of your Genesis Coupe’s OEM brakes. Shallow, sharp edged but radiused bottom grooves milled into cast iron discs to provide leading edges for bite and a path for the fire band of gases and incandescent friction material to be dissipated through. Slotting also prevents brake pad glazing and reduces debris by capturing and removing debris as you brake while driving- the result of the slotting is better braking, longer pad life and a reduction in rotor wear. If the slots fill up with pad material, the system is operating at too high a temperature. The problem: Most vehicles are built with cost in mind to some degree, and most cars come from the factory with rubber brake lines. These rubber brake lines, as you might imagine, being made of soft, stretchy rubber, have a tendency to expand under pressure. This expansion under pressure causes a loss of brake pressure and thus diminishes brake force and leads to a spongy feeling brake pedal. 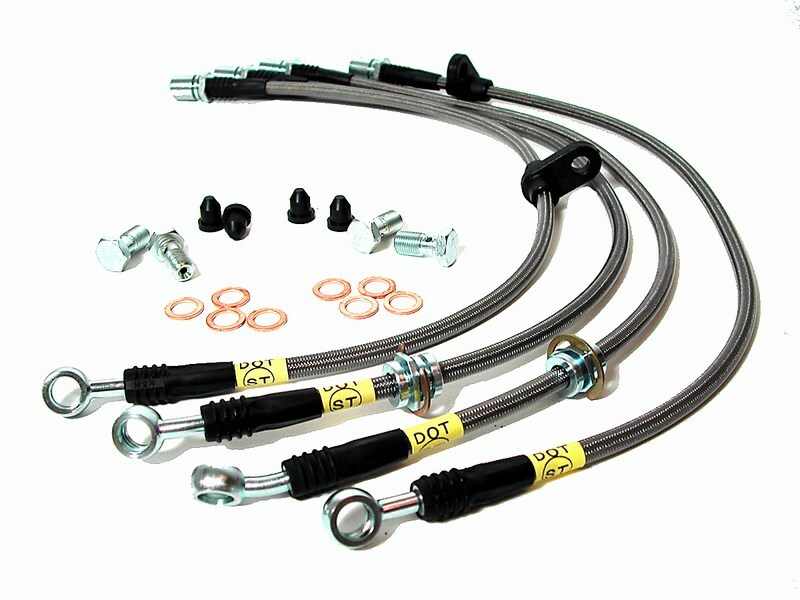 To fix this, you simply need to replace the rubber section of the brake lines with a set of high quality, flexible braided stainless steel brake hoses. Several manufacturers offer stainless steel braid protected extruded teflon hoses that satisfy all DOT requirements for passenger car use. Several other manufacturers claim to offer hoses which meet specifications that they do not actually conform to. It’s a real case of buyer beware. 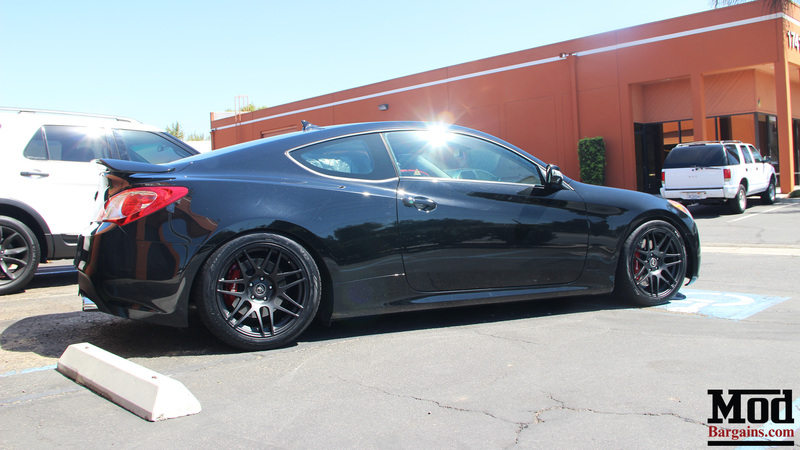 That’s why our experts recommend StopTech Braided Stainless Steel Brake Lines for Genesis Coupe. These flexible brake hoses are made of extruded Teflon® protected by a tightly braided cover of stainless steel wire. Thanks to the stainless braid, these lines virtually eliminate line swelling under pressure, and because they offer superior mechanical protection for the brake line itself, they are universally used in racing applications to reduce pedal travel, increase pedal firmness and allow more efficient brake modulation, which lets you stay in control and stop when you expect to. The fluid you have in your brake system has almost as big of an effect on your braking performance as your braking hard parts do. Under braking, the rotor gets extremely hot and also heats up the caliper. As the caliper gets hot, the fluid reaches its boiling point. When the fluid boils in the calipers, gas bubbles are formed. Since gasses are compressible, the brake pedal becomes soft and “mushy” and pedal travel increases. You can probably still stop the car by pumping the pedal, but efficient modulation is gone. This is a gradual process with lots of warning. 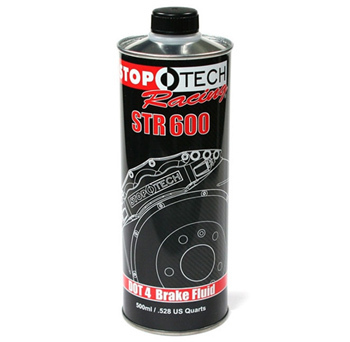 Designed to exceed DOT-4 Brake Fluid specifications, StopTech‘s STR600 Brake Fluid has a dry boiling point of 594*F and a wet boiling point of 404*F, this fluid is intended for aggressive street driving performance. By replacing your OEM brake fluid with StopTech upgraded brake fluid that’s rated for higher temperature operation, this prevents the fluid from boiling and creating air bubbles. What this means is that your brakes will last longer before fading and you’ll notice improved braking performance and improved pedal feel under braking. It’s worth noting that you should always bleed your brakes when changing the fluid to ensure all air bubbles are out of the system. The OEM brake pads aren’t the best material either, unless you opted for a brake upgrade package. Even then, typical OEM pads aren’t the grippiest and often are designed with concerns like noise and dust in mind before performance. Replacing the type of pad in your caliper will help your OEM brake calipers perform to the fullest of their abilities. Much like a stickier tire will allow you to corner harder, these alternate compound pads grab the rotor better than the OEM pad, improving brake performance and decreasing stopping distance. StopTech Street Performance Brake Pads combine the benefits of premium street brake pads with aggressive friction formulas suitable for track day and autocross use. Para-Aramid composites deliver optimum stopping performance over a wide temperature range and are specially formulated to deliver linear response in both cold and hot conditions. 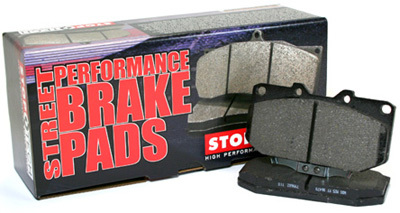 In addition, each StopTech brake pad is scorched to remove any impurities in the friction material. While this does not eliminate the need to bed-in new pads, it does provide improved stopping power right out of the box. Not sure what brake upgrade is right for you? If you have any questions about anything on this list, or just want some guidance on your next upgrade, we invite you to speak to our Modification Experts. Our Experts have years of experience and are all enthusiasts, who modify their vehicles themselves– so they can recommend the best fitment for your model and advise you of what the best part for your needs might be. 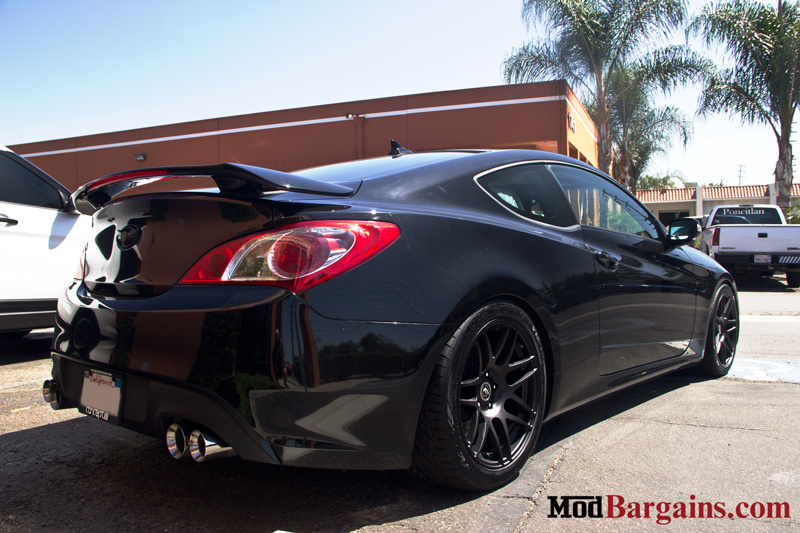 Call 714-582-3330 today or visit ModBargains.com to chat with a Modification Expert. 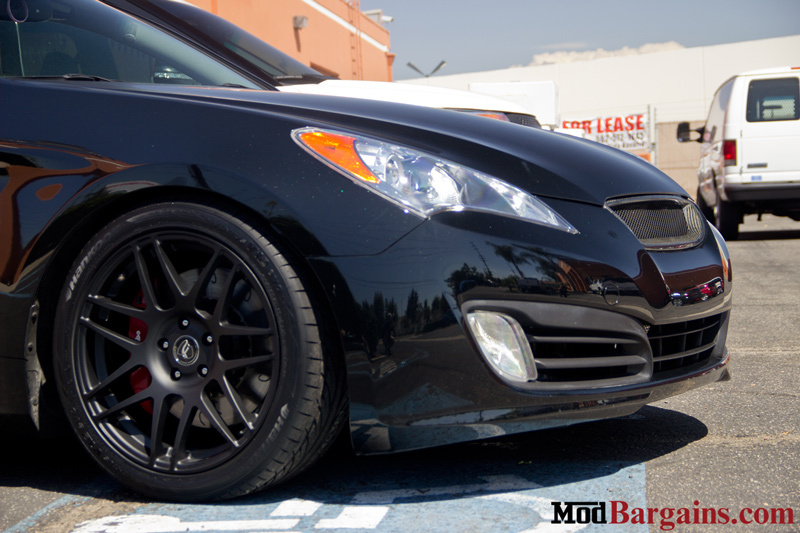 Should you need somewhere to install that brake upgrade for you, ModBargains offers full-service performance installation right here at our shop in La Habra. Call 714-582-3330 today to make an appointment.